AT the Sharing Languages, Sharing Cultures Annual Graduation event held at Shimna Integrated College in Newcastle, Baroness May Blood and Jim Fitzpatrick joined children from across a range of primary schools from 20-24 June to celebrate together their collaborative work in a year-long language project. Kevin Lambe, Shimna Integrated College, Brian Small, Integrated Education Fund, Paul Caskey, Integrated Education Fund, Brinda Holt-Curley, Integrated Education Fund Donor, Jim Fitzpatrick, guest speaker, and Laura O’Hare, Shimna Integrated College with graduates of the Sharing Languages, Sharing Cultures programme. 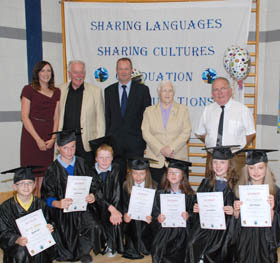 Pupils from 16 primary schools in South Down involved in the Sharing Languages, Sharing Cultures Programme donned graduation gowns and mortarboards to receive their certificates from the special guests in front of hundreds of parents and also local politicians. The Sharing Languages, Sharing Cultures Programme involves 375 primary school children who meet up with a partner school to receive weekly German or Spanish lessons, coordinated by Shimna Integrated College. The graduation ceremony is the prime element of the programme which brings home to the parents and local community, including our local representatives, the significance of the fifteen hundred children who have already benefited from learning together through Shimna’s Sharing Languages, Sharing Cultures programm. The ceremony included entertainment from current and past pupils of Shimna IC and the primary schools and ended with the graduates throwing their hats in the air to the thunderous applause of their parents and teachers. Shimna Integrated College initiated the project through Queen’s University Sharing Education Programme in 2006. The SLSC programme has been able to continue and grow to include more schools only through the support of funding from various organisations such as Atlantic Philanthropies, Parker Green International and more recently The Department of Foreign Affairs. 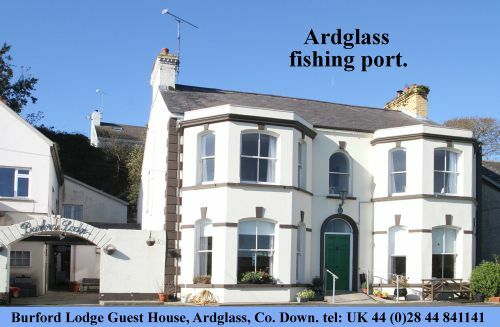 The programme also receives invaluable support from the Integrated Education Fund. Our special guests on both nights are also very supportive of the SLSC Project. Using a passport and a key, Baroness May Blood talked of the children’s bright futures and how languages could be key to their success. She said: “As Campaign Chair of the Integrated Education Fund, I am delighted to be supporting this unique modern language based shared education programme. 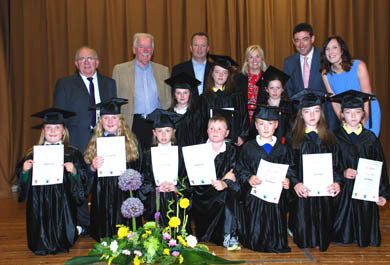 Jim Fitzpatrick, journalist and broadcaster, said, “I was very pleased to be guest speaker at the graduation ceremony celebrating the success of the young primary school students finishing their year on the ‘Sharing Languages, Sharing Cultures’ programme so ably run by Laura O’Hare of Shimna Integrated College. 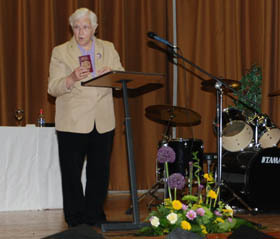 Baroness may Blood speaking at the Sharing Language, Sharing Culture graduation at the Shimna IC graduation. Kevin Lambe, Principal of Shimna Integrated College commented on the huge satisfaction of seeing Shimna as an integrated school founded by local parents give back to the community, allowing children in both single identity schools and in Integrated Primaries a regular opportunity to learn together as part of their normal weekly curriculum.